Last year, I wrote about the basics of telemedicine. That’s the health care delivery system with which patients connect with their doctors electronically, such as over the phone or via the computer. It represents a huge shift in how Americans access care and how physicians provide it. The growth of telemedicine in the United States is astounding. Read these statistics. Last year, there were approximately 800,000 online consultations alone in this country. 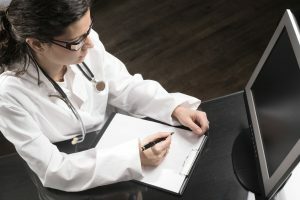 Right now, about 22 percent of employers with 1,000 or more employees offer telemedicine services, and another 37 percent are planning to add them by the end of this year. It is estimated that by 2018, the number of patients using telemedicine will increase to 7 million. That’s 7 million! The benefits of an electronic doctor appointment are many. It improves access to your doctor for one. You can see or talk to your doctor quicker, and you don’t have to drive to the office and wait your turn to be seen for a non-life threatening illness. It increases the physician’s availability to see more patients, too, so fewer are left without care. And of course, it costs less. Still, there are some doctors who aren’t totally sold on the idea. They’re concerned about the quality of the care provided when they can’t examine their patients in person. The patient/physician relationship suffers when there’s no physical touching or direct eye contact, they argue. In this May 2016 Medscape article, writer James M. Lebret, MD, points out that there will always be a need for hands-on visits, but that, in many circumstances, the quality of care for telemedicine patients can be as good as an in-person visit while providing increased access. There’s a certain amount of common sense that’s needed for telemedicine to be most effective. A telephone or computer appointment works well for illnesses such as flu, chronic cough, rashes, fever and urinary tract infections; chest pain not so much. You still need a full examination from the doctor and, likely, diagnostic tests for that. There’s a lot that can be done these days electronically, but the average person’s technology doesn’t allow for all the bells and whistles. That will come, I’m sure. It’s clear that there’s both a need and a desire for telemedicine in this country. If we use it right, it can improve access to care for a lot of people, including you and me. I’m up for making life easier with a telephone or computer appointment, how about you?